During my tenure on the Michigan State University Web Team, we were just starting to talk about how we could take the online campus map to the next level, throwing out ideas and developing prototypes. 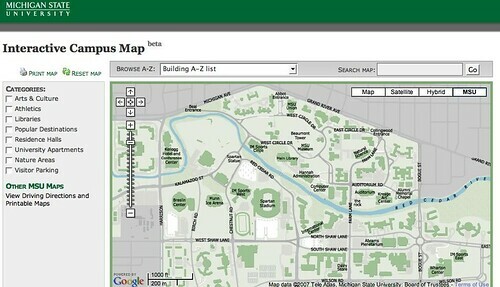 I am very happy to see that today they have launched the interactive campus map (http://maps.msu.edu/interactive/). It mashes up the building data with Google Maps. Users can easily do things like search for specific buildings on campus or look for all of the campus parking spots. Kudos to the team! It’s exciting to see this site out in the wild. I look forward to hearing what type of feedback they get.